Swing-Away® openers were hand-picked after careful testing. Bolts to wall so you can never misplace it! This one is terrible. we purchased in about July 2017. Installed in September 2017 rarely will open an entire can in one operation, usually 5-6 tries. The one we had before lasted 20 years, we left it at our previous home. we are disgusted with this one. The new Swing Away's are crap. 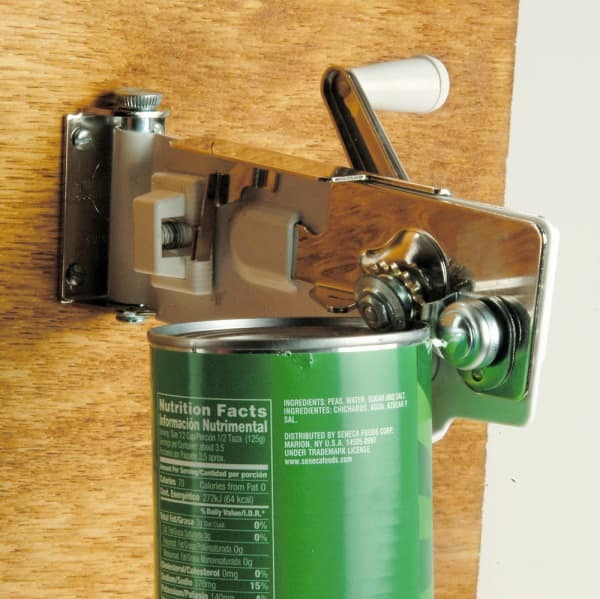 I am searching on line for a decent wall mounted manual can opener like my grandparents had, because I inherited their house and their old can opener had finally worn out. Came across this web site. I purchased one from Home Hardware and my father purchased the only other one they had, to use at our cabin. Both are junk. We can go round and round the cans and still not cut through most of them. Clearly the cutter wheel is too small. You would think the Chinese would have actually tested these before putting them into production. I found Lehman's selling this horrible working product and read the reviews warning people not to buy this. Their descriptions were exactly what I was experiencing, so I went to have a closer look at mine, and sure enough, it is a Swing Away. I have come to expect cheap hardware from Home Hardware, but Lehman's fosters a reputation of selling quality items. Clearly I will need to be far more discerning when deciding to purchase stuff from lehman's as well. Does not deserve even one star, since it doesn't work most of the time. Been meaning to write again but haven't shopped here in a while. The can opener that Lehman's sent to replace the defective one didn't work long either. ( Bought 1st around Oct last year, replaced in March, prob. worked part of the time 2 months) I have been using a hand crank one or calling my husband for assistance. I don't blame Lehman's. I think they did all they could. But this is not a good can opener. Lehman's should drop it & get a better quality one, even charge more, but get one that is worth the trouble to order.Didn't bother with a return again, this product. But the" swing-a-way" used to be a great product. I was very skeptical in ordering this since it is made in China. They have a history of manufacturing very bad products, but I did order it and have had it for a couple of years. I love the convenience of being in plain sight; so more fishing through a drawer of gadgets to find a can opener - it's right there in plain sight! I have to be very honest; it does NOT hang onto all cans. Some cans I have found work best up-side-down. Try it; you'll see it works better this way. Seriously don't buy it. I have had a Swing-away for 20+ years and I loved it. But after all the use I needed to replace it, I ordered a brand new one from Lehman's and the new cheap China made ones are horrible and don't work. I think I made it through the first 2 cans and possibly even 5, but after that it was done. I'm so so very disappointed so many products are made in china with such poor quality! Don't they have a pride in workmanship? Please stop selling the "look alike" versions of the good old products. I had similar issues with my clothes pins too - don't buy the china made ones. I'm the unhappy customer that wrote in Feb. Wish to let customers know Lehman's sent a new swing-a-way can opener to me upon finding out I wasn't satisfied. Will take more time to see if it keeps working... But both situations were "made right" by Lehman's, which I appreciate & my faith in them has been restored. Thanks. Ordered this last fall, think Oct, order # 470323. EMed u about a month ago explaining must go around can multiple times to get lid completely cut off. No response. Even EMed again when I ordered laundry detergent, explaining couldn't get advertised discount on detergent & u hadn't answered EM regarding can opener. No help with either situation. I'll keep the can opener but I'm returning detergent & u r fixin to loose my business if u ignore me this time! Lehman's says: Our sincere apologies! We're so sorry that you had trouble getting a hold of us. We experienced some technical difficulties, but have resolved them. We will be contacting you right away to make this right. Also, thank you for letting us know. Your feedback is much appreciated. After 3 months of use the blade started skipping around leaving the can lids leaving the lid attached in several spots. Then no matter how hard I tried to pry the lid off it wouldn't come off. Also when cranking the opener it wanted to jump up and down in the mount on the wall which made it very difficult to control the can. I had a Swing a way for years that was made in the US, but left it behind for the new owner; this one is made in China and is a complete piece of junk. Lehman's says: We're so sorry for your experience. Please give us a call, so we can make this right: 1-800-438-5346. We always had a swing-a-way can opener i have used the same one for about 20 years and it is still working great. My sister is having trouble with Her electric opener so she is getting a swing-a-way. Swing-A-Way got its reputation over many years. If you can find a U.S.-manufactured version, this will work much better and longer than the commonly sold imported one. I can't find one myself, so good luck. These can openers work great. They cut quickly and smooth even on larger cans. We have used these can openers for years and my grandmother had one. We couldn't find replacements. We were so happy to find them in your catalog because ours were all too dull to work anymore. Thank you! Myself and my sisters all have new ones now! Placed my order on 5/7/12 for this item. It worked good for a while, but hasn't worked properly in months. Back on my quest to find a quality can opener & this product is not it. I remember my mother and grandmother having these in their kitchens. I was so sick of buying hand held can openers that never work or only work a few times. So I bought one of these about a month or so ago. It is great! I will never have anything else to open cans with again but a Swing-away. We had a swing away for many years worked great but it just wore out. I bought a new one worked okay for a while now just tears the top of the can, not sure why. I oiled and cleaned it may have helped some but still not working correctly. I don't know if they are making the cans cheaper or if the can opener is cheaper, not the same as the old one we used to have. My Mom had one of these when I was a child. They are even better than I remember. Absolutely wonderful. Thanks! Excellent product. Just like the one my parents had in the 50's. Opens everything easily and removes from the mount for easy cleaning. Goodbye to the electric frustration machine. Thanks Lehman's. I bought this item for our 'Camp' which had the same one in place for 45 years until it broke. Mounted it with ease,works like a dream! It's the ONLY can opener we have in our house ~ got rid of the rest of them because we don't need them! Our son likes it so much he bought one for his grandmother and she loves it too. Our son recently bought his own house so we bought a cheap can opener for immediate use. Total waste of money. I'm online now buying him the only one he'll ever need! If you had a 0 rating that would be mind. My parents had one, made in America, and it last some 60 years. I have, so far, purchased 3 with 1 replacement and none of them worked. They are sorry as can be and made in China. I want to see Lehman's carru American-made products. Wonderful opener, works especially well with the gallon cans. My wife uses it constantly while canning. Thanks. I bought this can opener several years ago and liked it so much we bought one for our daughters for Christmas last year. Now we have request from my mother-in-law and brother for this Christmas. Same exact can opener that has been around for decades. Didn't even have to replace the mounting plate, just dropped the new opener in and put in the pin. Done. I hate electric can openers and always have. This is the second wall-mount Swing Away I've ordered from Lehman's. The first was left at another home upon moving, much to my distress. It's like an old friend, but I do wish they'd make a red one like my grandma had.